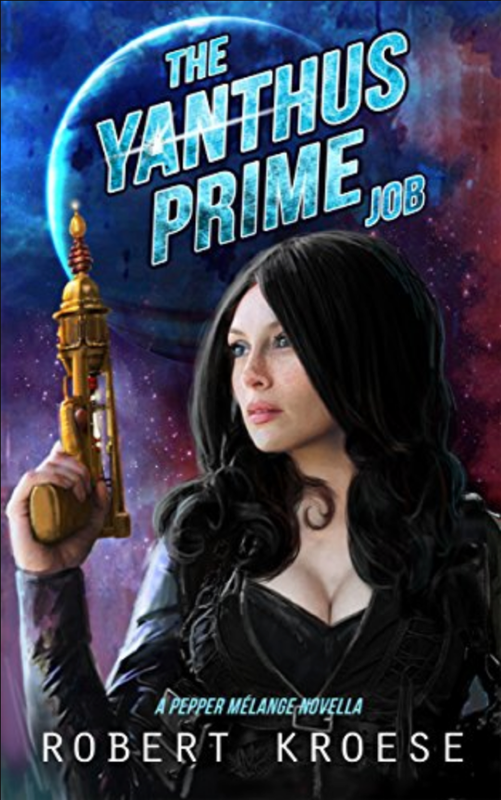 The Yanthus Prime Job by Robert Kroese is a novella featuring Pepper Melange from the Rex Nihilo / Starship Grifters series. This is by far the best story out of any of the Starship Grifters books, though available separately it is also included in Aye, Robot, book 2 of the series. There is not a single bit of Rex Nihilo in this short to annoy, and where Nihilo is an annoying doofus, perhaps like Bill the Galactic Hero but more like that douche Zapp Brannigan, Pepper Melange is smart and capable and funny and perhaps merely a few words of Esperanto away from being as cool as Slippery Jim diGriz, who you may know as The Stainless Steel Rat, with a little bit of Scarlett Johansson’s Black Widow for good measure. I really liked this story and the main character in this story. Pepper Melange seems to me to suffer a bit of a personality change and is short changed by being a supporting character in her appearances in the other stories, but here there is just her and her complicated caper plotting savvy and snappy shenanigans that go awry to enjoy. I’d love to read more stories with Pepper Melange as the main character, but this makes a nice complete story by itself, which I’ll have to be satisfied with. If I hadn’t read this story, I probably wouldn’t have bothered to pick up the other books in the Rex Nihilo series, but I did and I did. To be honest, I’d be more excited about the others remaining in my to read stack if I knew they featured Pepper Melange instead of Nihilo. This entry was posted in Hermetic Library Reading Room and tagged book, John Griogair Bell, review, Robert Kroese on November 1, 2017 by John Griogair Bell.